– Sir Ken Robinson, Ph.D.
To effectively implement the Common Core State Standards, there needs to be a plan for how to measure the effectiveness of the instruction being delivered. This cannot be accomplished in isolation. Rather, schools need to embrace the power of collaboration and ensure a collective responsibility for all students. One way to do this is through the formation of learning teams. Learning teams are also known as professional learning communities, data teams, or collaborative inquiry teams, and consist of groups of people working towards a common goal and who are mutually accountable for the work. What matters most is the collaborative work that is done by the team, and not what a school decides to call it. In his Phi Delta Kappan article, “Tipping Point: From Feckless Reform to Substantive Instructional Improvement,” Mike Schmoker states, “There is broad, even remarkable, concurrence among members of the research community on the effects of carefully structured learning teams on the improvement of instruction. Add to this that such structures are probably the most practical, affordable, and professionally dignifying route to better instruction in our schools.” Even though research widely supports the effectiveness of learning teams, they are still not the norm in our schools. Rather than looking at short term cycles of reflection, action, and improvement, schools have depended on lengthy annual plans to drive their work. Instead of trying to change an entire system, schools would benefit from small groups focused on collaborating to achieve short term gains for struggling students. The formation and implementation of learning teams ensures evidence-based practices that will improve the quality of instruction and increase the achievement of students. Learning teams consist of grade level or department members who share responsibility for increasing the achievement of students. In schools, learning teams are the basis for instructional improvement and have the power to improve teaching and learning for all students. Learning teams are a part of an ongoing process where there is a focus on action and results. The purpose of this issue is to provide schools with a roadmap for building and implementing effective learning teams. In the section that follows, readers can familiarize themselves with the conditions necessary for effective implementation along with some strategies to begin the learning and engage teachers in effective, collaborative discussions about student learning. The establishment of learning teams can represent a significant culture shift if a school or district has not made a practice of having groups of educators come together to make decisions using the work of their students. Prior to taking any action, leaders need to ensure that team members understand the purpose for such a team and what their role will be as a member. It is important for members to know that learning teams give teachers the opportunity to collaboratively look at their students’ results, make observations, generate questions, make inferences, and most importantly, make decisions that will improve instruction. The essential ingredients for the success of any team are collaboration and trust, along with a shared commitment to assume responsibility for every student. As a result of the work done in learning teams, students will receive the support they need to be successful. In learning teams, teachers make sense of their students’ work together. They will understand their students at a deeper level and be able to get at the root cause for any challenges their students face. Working as a team allows teachers to generate the most effective solutions along with a diverse set of options for intervention. Ongoing collaboration, inquiry, and dialogue about teaching and learning ensure better results for students. In order for learning teams to be effective, certain conditions such as ample time to meet, training in the inquiry process, norms for collaboration, the use of protocols, and skilled facilitation are necessary. There needs to be a culture of inquiry, with student data at the heart of the process. Time is among the scarcest of resources in our schools, yet it is central to the success of learning teams. Leaders need to think creatively about ways to give learning teams common time for inquiry-based discussions around data and student work. Some ideas include using grade level or department meeting time, faculty meeting time, after-school professional development time, early release days, release time with substitute teachers, or the creation of master schedules that give learning teams common planning time. Finding and securing time for learning teams requires creative thinking about the best sustainable ways to organize resources and people. Once collaborative time for learning teams is secured, there needs to be structures in place to ensure that the time given is used productively. It is the marriage of careful planning and skillful facilitation that make learning team meetings successful. To begin, each team needs to agree on a common set of norms that will govern how group members will treat one another and participate in the discussion. Norms are positive commitment statements that articulate how team members will act. These agreed upon norms help to create a safe environment where participants are comfortable sharing ideas, taking risks, and posing questions. When developing norms, all members of the group should participate. There are a number of different ways teams can establish norms and there is no one right way. What is essential is that once they have been developed, every team member agrees they are the appropriate actions to guide their behavior during each meeting. Norms should be reviewed at the beginning and end of each meeting. In order to be effective, there should not be more than a few essential norms. We will listen respectfully to the ideas of others and consider multiple perspectives. We agree to not blame students or other teachers for any challenges or problems that surface. We will all act as contributing members of the learning team. We agree to arrive on time, be prepared, and engage in the dialogue for the duration of the meeting. We agree that all voices should be heard in our discussions and that one voice should not dominate the group. How are our students improving as writers? How do our outcomes vary by classroom? What impact has our after school math intervention had for student learning? Which mathematics concepts have been the most challenging for our students? How can we meet the needs of our most struggling readers? To what extent has attendance impacted achievement for our students? What had the greatest impact for readers who made significant progress this year? How do our reading levels compare across classrooms? When teachers meet collaboratively to pose questions about their students, then gather the data that will help to answer those questions, they strengthen their knowledge of the content they teach, understand their students at a deeper level, and strengthen their instructional practices. The discussion of data should not be limited to the analysis of high stakes testing one time per year. Similarly, the word data deserves a better image among educators. Data should be thought of as synonymous with the term evidence. Therefore, any student work or information about our students is data that could potentially impact how we think about teaching and learning. In lieu of only analyzing local and state standardized assessment data, research has found that teacher-designed assessments and student work have a much greater impact on the work of learning teams. For instance, teams may decide to collect student products for an assigned task and investigate how the students performed as indicated by a common rubric. Teachers can use a variety of data daily, monthly, quarterly, and annually to shape their instruction and deepen their understanding of their students, as well as the content they teach. Formative assessments, benchmark common assessments, and summative assessments provide important data. While many formative assessments are individualized by teacher, there are also formative measures that are common across grade levels or departments. These are measures given by a team or department in the same window of time and then analyzed by the learning team. These common assessments are extremely valuable for learning teams and should be considered at least once a month. Benchmark common assessments can be used both formatively and summatively, or after the instruction and learning have occurred. They can be used formatively to strengthen classroom instruction and can be used summatively to identify the success of a program. Some summative assessments are common across a grade level or department, and are given at the end of a unit or course. As with common formative assessments, they are given by the teachers in a specific grade level or department in the same window of time and then analyzed by the learning team. Common summative assessments need to be aligned with the standards and the curriculum, and teachers should be able to access the data, as well as the assessment questions themselves, for each item assessed. Because they are given at the end of instruction, summative assessments are valuable for showing which students have mastered the concepts or skills that were assessed. Common summative assessments can also shape curriculum and instruction, impacting things such as pacing, essential content, and sequence of instruction. These are assessments of learning that include state assessments or district assessments given annually. Summative assessment data is more challenging for learning teams to use effectively, unless teams are able to actually see the students’ work in a timely manner and analyze specific items by disaggregated groups such as gender, language, disabilities, or ethnicity. Very often it is these assessments that have highly involved scoring processes and secure questions, so consequentially data is not provided in a timely manner and teams are unable to drill down enough to glean information that would be beneficial at the classroom level. It is up to each learning team to decide on the best data to use to answer the questions they have posed about their students. In order to do so, school leaders need to help team members understand what data exists, when and how it can be accessed, and which students are impacted. Teams should have a sense of the purpose of all assessments, as well as the timeframe in which they are given. There is also power in knowing the timeline for data collection, as it can inform which data learning teams can access at different times of the year. It also gives learning teams a big picture look the information that is available to them as they begin to work with their new students in September. As we know, time is a huge roadblock that prohibits many schools from effectively learning from data. One way to optimize time is to consider a small team that could assume responsibility for organizing and preparing the data. This team could assume leadership for the collection of data, organizing the data for easy interpretation, and possibly creating visuals such as graphs to further support the conversations about the data. Members of the group responsible for collecting, organizing, and preparing data for distribution typically have technical skills, as well as organizational strengths. What will we do if they aren’t learning? What is the evidence of student mastery of the standard(s) taught? Where are there gaps in students’ understanding? What can we learn about students’ thinking by looking at this work? Nancy Love, in her book Using Data to Improve Learning for All: A Collaborative Inquiry Approach, defines the following steps in the collaborative inquiry process. Prior to looking at the data, teams are asked to predict how students performed and what they expect to see. This helps the team to prepare to understand the data. This is a phase that is often overlooked in our fervor to learn from the data. Predictions help to set a purpose for looking at the data and provide guidance as to what teachers should be analyzing in the students’ work. What do students need to know, understand, and be able to do to be successful with the task? How do we think our students performed? Where will they do well? What types of errors will they make? What are some of our assumptions? In this phase, the data is recreated visually on large sheets of paper or on a wall. Participants also have a copy of the visual representation and can mark it up using different colors or sticky notes. Participants might also create their own visuals to make sense of the data for themselves, or to compliment the visuals shared with the entire learning team. Once student work has been distributed, the team sets aside any assumptions they may have about the data and spends time noticing what the student work/data is showing. This phase includes observations only, no inferences about why students performed in the way that they did. As teachers, our tendency is to jump right to conclusions and solutions in order to “fix” the student learning problem. Taking time in the observation phase of the collaborative inquiry process ensures that the instructional strategies or interventions that are put in place are addressing the appropriate student learning challenge. What do you notice as you look at the data? What do we notice about individual students? What is surprising about the data? What stands out as you look at the data? What misconceptions/errors do you see? During the inferencing and questioning phase, teachers begin to generate some possible explanations for what they are seeing in the data. What do we believe is the root cause of any challenges students faced? What is the student learning problem that we need to solve? Did we use appropriate instructional strategies to teach these concepts/skills to our students? How did students receive feedback on their work? What else do we need to do in order to teach this content even better? Is our assessment aligned with our goals for students’ learning? Once learning teams have engaged in collaborative inquiry discussions, the next step is to identify a clear student learning problem that needs attention. That learning problem will then become a goal for the team to accomplish. In working to meet the goal, teams need to think about what they will do for students who have already met the expectations of the task, as well as students who have not yet met the expectations of the task. How can we modify our presentation, materials, and exemplars to enhance the learning of our students? Will we provide feedback to students? How? To whom? Are students ready to move on? How do we know? It is up to teams to identify specific teaching strategies to address the targeted needs as determined by the collaborative inquiry process. Teams should decide if their next steps require teaching differently, increasing student engagement, assisting struggling learners, and/or extending the learning of students with challenging tasks. Once the learning teams have committed to the teaching of a particular strategy or use of a targeted intervention, the team needs to agree to monitor its implementation, as well as how it impacts student achievement in the identified area. The team should establish what student work will be brought to the next meeting as evidence, as well as the criteria of assessment for that work. For example, based on students’ performance on common math tasks, one learning team decided to use a bar model as a strategy to help students visualize the relationships between fractions. Once the strategy had been taught, students completed daily problems using the bar model for representation. The team then administered another common math task and came back together to review student work and then set a new action step. In summary, learning teams represent a collective effort to ensure learning for all students. Instead of becoming mired down in lengthy improvement plans and documents, learning teams take action and set short term goals which are carefully monitored for results. Evidence of student learning is what lies at the heart of the work, and it is the collaborative inquiry process that leads teams to improved student learning for both students in need of intervention and those in need of enrichment. To further support readers around the implementation of learning teams, the next Making the Common Core Come Alive! will take a closer look at protocols that are effective for establishing, facilitating, and reflecting on the learning team process. 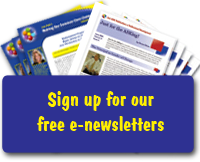 This link includes articles, research, and resources to support the implementation of learning teams, referred to here at professional learning communities. This article from ASCD discusses how looking at student data to answer important, essential questions can have a number of benefits. Clayton, Heather, Brenda Kaylor, Bruce Oliver, Julie McVicker, Paula Rutherford, Sherri Stephens-Carter, and Theresa West. 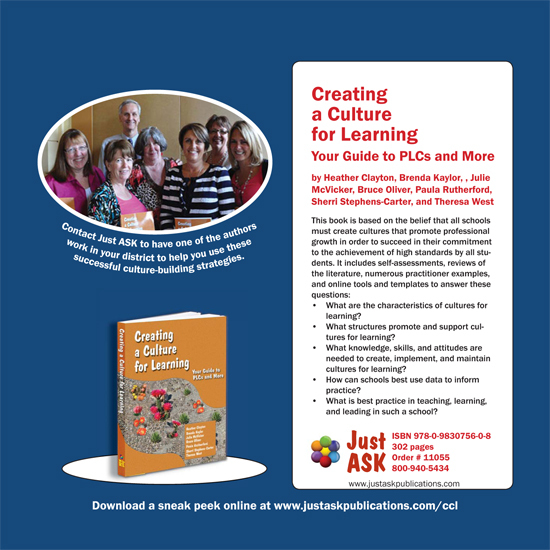 Creating a Culture for Learning: Your Guide to PLCs and More. Alexandria, VA: Just ASK Publications, 2011. Love, Nancy. Using Data to Improve Learning For All: A Collaborative Inquiry Approach. Thousand Oaks, CA: Corwin Press, 2008. Mike Schmoker’s article in Phi Delta Kappan entitled “Tipping Point: From Reckless Reform to Substantive Instructional Improvement” explains the rationale and research behind learning teams. Murphy, Michael. Tools & Talk: Data, Conversation, and Action for Classroom and School Improvement. Oxford, OH: Learning Forward, 2009. This link from the National School Reform Faculty provides a plan for establishing norms, or ground rules for learning teams. Wellman, Bruce and Laura Lipton. Data-Driven Dialogue: A Facilitator’s Guide to Collaborative Inquiry. Sherman, CT: MiraVia, LLC, 2004. Clayton, Heather. 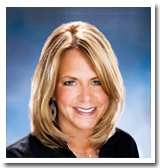 “Learning Teams: Data-Driven Decision Making.” Making the Common Core Come Alive! Volume IV, Issue II, 2015. Available at www.justaskpublications.com. Reproduced with permission of Just ASK Publications & Professional Development (Just ASK). ©2015 by Just ASK. All rights reserved.